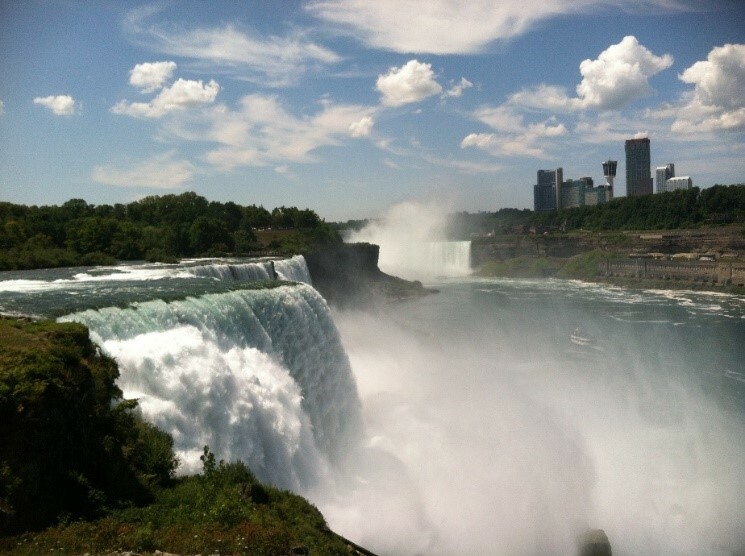 Sweet picture of the Niagara River in Niagara Falls, New York. I’m sure you came up with things like fish, algae, dirt, plants, and many others. But one thing found in these water bodies that you may not have thought of and that I’m really interested in studying is natural organic matter, or NOM (not to be confused with the sound you make while eating a delicious meal). NOM dissolved in water is hard to detect with the naked eye but can be readily detected using a variety of scientific instruments. A glass of water with and without NOM, for example, would look very similar to the naked eye, with just a slight color change. However, it turns out they differ in some very important ways. 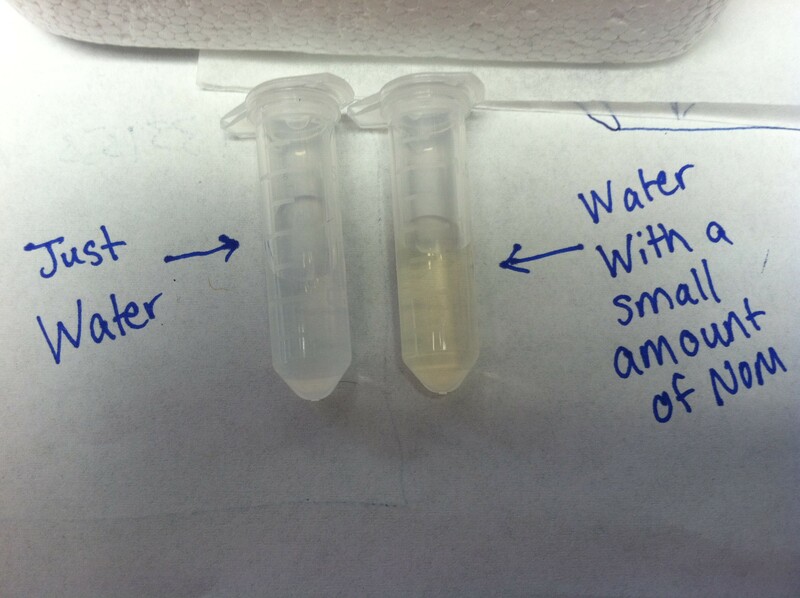 Pure water (left) vs water with natural organic matter (right). At this high of a concentration, the natural organic matter gives the water a slight yellow color. Rivers and lakes have plenty of living organisms (such as plants and animals) that reside in them. However, once these organisms die, their remains will be broken down by fungus and bacteria. You can think about NOM as the breakdown products of once-living organisms as well as products they leave behind (feces, leaves, etc.). NOM is present all over ecosystems—in soil and sediment as well as floating in water. NOM plays a few important roles in the ecosystem. First of all, it can provide nutrients to different organisms. For example, some micro-organisms rely on NOM as a source of food, whereas some plants gain a nutrient boost from the presence of NOM. It can also help reduce harmful changes in water acidity. NOM also plays a key role in the movement of a variety of different chemicals throughout the environment. Without NOM, certain metals (lead, copper, zinc, etc.) as well as natural oily chemicals would be much less mobile. However, scientists have shown that NOM mobilizes these chemicals, allowing them to travel much further than they would have otherwise. Without taking NOM into consideration, scientists might predict that a certain chemical (a metal, for example), would enter the water and come to rest at the bottom in the sediment. However, NOM can act as a shuttle and help move that chemical throughout the entire water system where it could come into contact with a variety of organisms. Therefore, without taking NOM into consideration, it would be nearly impossible to predict just how different contaminants and materials will behave in the environment! It is really the complexity and diversity of the chemical make-up of NOM that make it such an important yet complicated player in the fate of chemicals in the environment. Living organisms are made up predominantly of organic (carbon-containing) compounds. Therefore, their breakdown products are also made predominately of carbon. While this may make it seem like NOM should be quite simple, NOM is actually very complex. In fact, NOM is so complex that no one actually knows for sure exactly what its atom-by-atom chemical structure is! 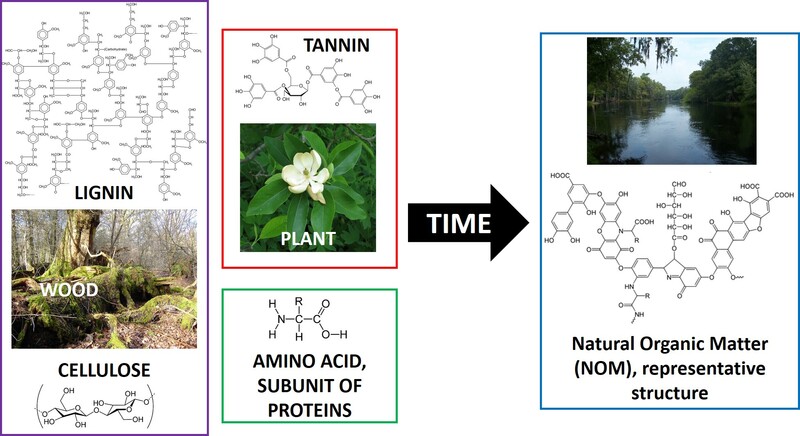 This diversity and complexity stems from the variety in the “starting” structures of the NOM – the different plant and animal breakdown products such as cellulose , tannin, cutin, lignin, proteins, lipids, and carbohydrates. While these components on their own may seem simple, as the compounds break down they can polymerize, or join together, forming more complex species. As a result NOM is made up of complicated structures that loosely resemble the starting material structures; the only thing we know for sure is that it contains carbon, oxygen, and hydrogen. The chemical compounds that make up different living materials (plants, trees, organisms, etc.) can decompose and join together to form the complex mixture of chemical compounds that makes up natural organic matter. Image adapted from sources: 1, 2, 3, 4, 5, 6, 7, 8. The above structure is just one representative example of what NOM may look like. You can see that it is quite complex. For example, different parts of the molecule have differing affinities for water, and the structure has groups that will be neutral at an environmentally relevant pH and others that will be charged. The environment in which NOM is formed plays a critical role in determining the specific properties of any given sample of NOM. For example, a NOM sample from Alaska will have quite different properties than one coming from the swamps of Georgia; these areas have different plant and animal life, which leads to different breakdown products and different compositions of the NOM present in these areas. An organization called the International Humic Substances Society has established and maintained a collection of representative standard NOM samples from different locations. This allows scientists from all over the world to work with similar NOM samples coming from the same locations (which is pretty awesome!). As I mentioned above, one of the roles that NOM may play is to interact with different materials that are released into the environment. At the Center for Sustainable Nanotechnology, we’re really curious about how the chemical composition of nanoparticles affects how they will behave in the environment. So, we take great care in making nanoparticles with very well-defined surface coatings. However, it is likely that when a nanoparticle enters the environment, it will be in the presence of natural organic matter. This nanoparticle could then become wrapped in NOM instead of whatever coating we carefully placed on it. As a result, we need to understand the impacts that NOM may have on the properties of the nanoparticles and thus on different organisms those nanoparticles may encounter. 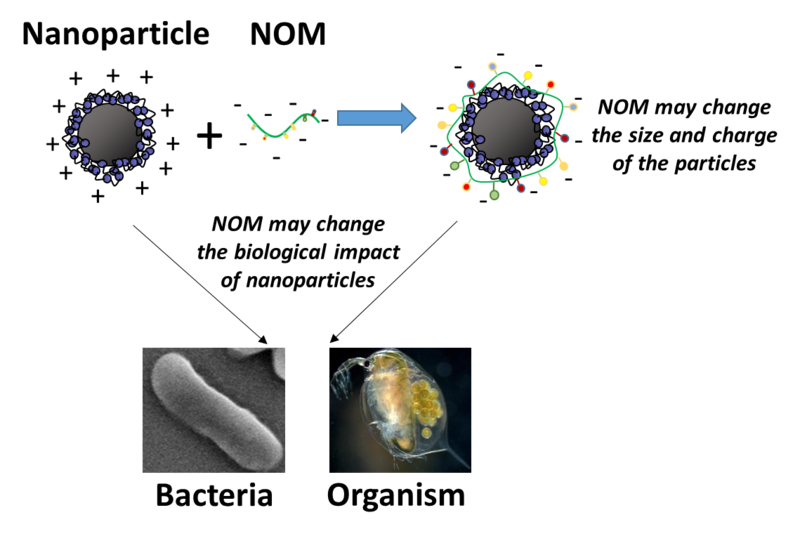 NOM may interact with and change the size and/or charge of nanoparticles, which could then impact the way that they interact with different organisms. It is also possible that NOM can help keep nanoparticles floating in water or cause them to clump together. NOM can coat the surface of nanoparticles, which would cause the properties of those nanoparticles to change. Therefore, it is important to understand these impacts and how the particles will interact with different organisms in the presence of NOM. Image adapted from source 9. We can actually carry out these studies by first analyzing the size and charge on the nanoparticles that we synthesize in the Center and by seeing how these nanoparticles interact in a certain way with different organisms (such as bacteria or water fleas). We can then take a sample of NOM (right from the International Humic Substances Society) and introduce the nanoparticles to a solution of NOM. We can see if the NOM causes any changes in the size or charge on the nanoparticles, and investigate whether that has any impact on the way those nanoparticles interact with living organisms. What I am currently working on is using the quartz crystal microbalance, which I described in my last blog post, to see how nanoparticles interact with lipid bilayers (a mimic for the outer membrane of organisms) in the presence of NOM. If NOM is present in the environment, it’s really crucial to make our laboratory experiments reflect this to give us the best chance to really understand the impacts nanoparticles may have on our environment!